The Auschwitz museum authorities in Poland have urged visitors to not balance on railway tracks posing for pictures. Officials at the former Nazi death camp told visitors that there are 'better places to learn how to walk on a balance beam' than at the site. It was a camp built by Nazi Germany in occupied Polish territory. The train at the memorial in Poland was used during the Holocaust to transport prisoners to the gas chambers where they were killed. Around 1.1 million people died of which 90 percent were Jews. It is located in Poland's Oświęcim town that known as Auschwitz while under German occupation. Auschwitz Museum took to Twitter urging people to respect those who died at the died and not consider it as a place to learning balance. 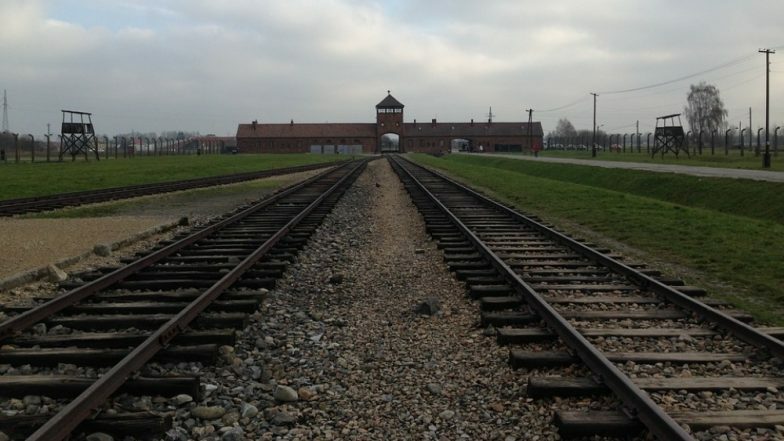 Along with sharing pictures of visitors who tried balancing on the tracks, the museum authorities wrote on Twitter, "When you come to Auschwitz Museum remember you are at the site where over 1 million people were killed. Respect their memory. There are better places to learn how to walk on a balance beam than the site which symbolizes deportation of hundreds of thousands to their deaths." Karnataka: Four Youths Who Vandalised Hampi Temple Complex Made to Re-Erect Pillars, Pay Rs 70,000 Fine Each. The authorities clarified that photography is not banned but only to not learn to balance there. On Wednesday, the officials said, "Photography at Auschwitz Museum will not be banned. Yet we ask visitors to behave respectfully, also when taking pictures." The camp was liberated on January 27, 1945, by invading Soviet forces. The date is today marked as Holocaust Memorial Day in the UK.